King & Country – Battle of the Bulge In Stock Now! BBA030 — “M3A2 Half-Track” K&C’s first all-new U.S. Half-Track for a few years and one of the most often requested. This classic armoured troop transport served U.S. Forces and their Allies loyally throughout the War and even into the late 1970’s (with the Israeli Army). 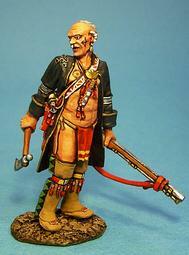 Our GI version comes complete with a driver and a standing .50 calibre machine gunner and his crew-served weapon. This winter-version also has a detachable canvass cover for the troop compartment. A towing hook at the rear of his vehicle is also suitable for pulling. BBA031 — “The 105mm Field Gun Set” A superb model of the most famous field piece of the U.S. Army in WW2. Our “105” has rolling wheels, moveable trail arms plus 3 gunners to fire the artillery piece. The barrel is in a fixed position for firing and transporting. BBA032 — “Artillery Add-On Set” 2 additional Artillerymen are also available to crew-serve this great field piece. In addition we also supply extra ammo boxes and a pile of shell tubes (used for carrying the rounds). BBA033 — “U.S. Artilleryman” A lone “Gunner”, rifle slung “humps” three more tubes of rounds forward to the guns. BBA034 — “Kneeling with Field Telephone” A kneeling corporal listens for a “fire order” and grid coordinates for his buddies about to shell an enemy location. BBA035 — “Winter Motorcycle MP” A long overdue addition to our U.S. Forces and our first new MP on a motorcycle for many years. This MP is on the road, somewhere in Belgium or Luxembourg giving out directions (as MP’s like to do). He’s well-wrapped against the winter weather as well! 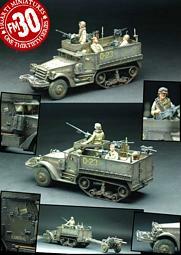 BBA036 — “Half-Track Passengers” A really great little 3-man grouping… Two sitting GI’s and their Nazi Prisoner. These guys can be seated in a variety of ways inside our new Half-Track or posed outside in a display or diorama, very useful! Figarti – New December Releases. Figarti have announced the following new limited edition releases, expected some time in December. As usual production is limited to only 100. Can easily be cut and shaped using scissors or a model knife. This can be glued down to a base board to create a permanent display, or simply placed on a shelf for an instant effect. In stock now we have the final 2 buildings for this new series. They are superb. SP033 — “The Stables” A very versatile (like all the other DV structures) that can be utilized in a wide variety of settings and historical periods. SP034 — “The Watch Tower” A key feature of any small village or town in the Middle and Near East was the Watchtower. From this high vantage point any strangers could be seen as they approached the village and if necessary alarms could be sounded. Watchtowers were often used a temporary store houses for grain or occasionally as the local jail for wrong-doers and trouble makers! The K&C tower comes in two separate pieces which easily combine to make a tall and imposing structure. This introductory vignette based on the painting by George William Joy, an Irish painter born in 1844. He was probably best known for his painting of the death of General Charles Gordon, a British national hero and icon, who died defending Khartoum against the Mahdi. (painted in 1885 and currently on display in the Leeds City Art Gallery). This will be the first part of a 4 part release. The complete four parts will cost approximately us$350. The Stairs will be a Numbered Edition and the accompanying set will also have a certificate with the same Numbered Edition enclosed. Only SUD-01 will be a Limited Edition. 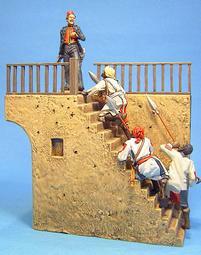 This set presents the final two figures based on the famous David Morier painting “An Incident in the Rebellion of 1745”. This will also be the first of 5 hand to hand sets to be released over the next 6 months. The capture of prisoners during a patrol was an important method of gathering information and intelligence. The Oneida Chief SCAROUYADY, sometimes called MONACATOOTHA, as early as the 1740’s acted with the Seneca Chief TANAGHEISSON (Half King) as a representative of the Iroquois Confederacy among the Delaware, Shawnee, and other native peoples living near the forks of the Ohio river. Chief Scarouyady was one of a handful of Indians who accompanied the Braddock expedition against Fort Duquesne in 1755. His son was killed in a friendly fire incident with British soldiers several days before the Battle On The Monongahela. Never the less he was one of 8 Indians who remained with Braddock as a scout. He was later noted to have said that he felt the General held them in contempt and failed to listen to their advice. Some of the details of Scarouyady’s distinctive tattoos and war marks have been found in Captain Robert Orme’s notes and sketches. Please note this set is only available for Pre-Order until December 31st, 2009. The plan is that only the exact numbers of pre-order sets will be made. This set is only available to Club members and will only be available to those that have pre-ordered it. The following new releases have just arrived and are in stock now! Collectors Showcase In Stock Now! In stock now the new series 8 arrivals later on this week. 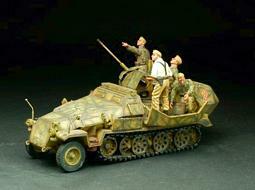 I understand that the Collectors Showcase German Panthers are already sold out, so we have very limited availability. 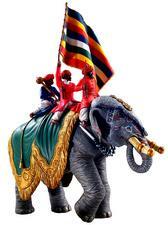 He is planning on a restock in December or the Panther with Zimmerit. Only 120 more will be made, so please do not wait to long. There is a possibility of more standard Panthers, but the production schedule has not been committed to. We saw these new releases at the Chicago Show and we were very impressed.